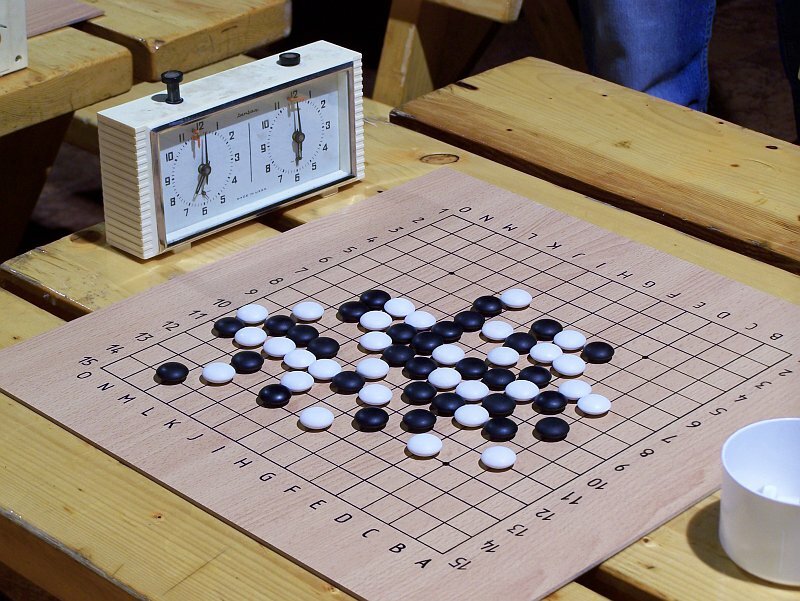 Gomoku is a logic board game played by two persons. It is played with black and white stones on a 15x15 intersection Go board made of wood. In the beginning of the game the board is empty. The player who controls the black pieces starts the game always. Moves must be placed on the intersections of the board, not on the squares closed by the lines. Black plays first, then white turns and this process continues until the end of the game. The players alternate in placing a stone of their colour on an empty intersection. The stones put on the table remain untouched till the end of the game. Getting down, removal or touching of stones are forbidden. It is naturally allowed to adjust a position of a piece when it is preceded by a sign. The winner is the first player to get an unbroken row of five stones either horizontally, vertically, or diagonally. Winning the game requires a row of exactly five stones; a row of six or more stones - called overline - does not count. In the diagram below you can see a sample game, in which the numbers written in the stones show the order of the moves. Naturally in real game moves do not contain numbers. In this case black won at the 21st move with a vertically unbroken row of five stones. The unbroken row of five stones can be collected in the middle and in the edge of the board as well. Samples of collecting five stones in a row. The basics of the game are clear by now. At first sight this game seems to be a simple one, which doesn’t require so much power of mind, but it’s a common error. The more you get to know the game, the less you think that collecting five stones in a row is such an easy job. You spend a lot of time with building up a good line, and when you reach the winning point your opponent just blocks your line easily and it turns out that your attack was not worth much. For a more effective play you must understand some notions and structures of game theory. Only the appropriate use of these structures can bring you victory. The attacking structures of the game are on the basis of using ’threes’ and ’fours’. Victory is yours if these lines are not blocked by your opponent. ’Four’ means a line built up from 4 consecutive stones from the same colour which threatens in the next move with the winning fifth move. So to avoid losing this line must be blocked immediately. On the upper diagram you can see all possible types of ’fours’. If black is on the move, he can gain victory by placing his fifth stone to points ’A’ or ’B’. Points signed with ’B’ show ’half-opened fours’. This means that if white turns, he can avoid being defeated by blocking the four. Points signed with ’A’ show ’opened fours’. In this case white cannot avoid losing, because no matter which end he blocks black will add a fifth stone to the opposite side and will have won the game. Thus the main goal of the game is to create an open line of four stones in a row before your opponent does. Opened fours can only be made from opened threes. So if you want to win it is indispensible to create opened three (points signed with ’C’ show places where opened fours can be made). As you know already, if your opponent has an opened four, you will have lost the game. But before it, your opponent needs an opened three so as to create an opened four, that’s why you always have to be so careful and pay attention to defence inevitably when you have discovered that your opponent has an opened three, only if you have win. At any points signed with ’D’ white can easily stop black’s opened three lines and after that those lines won’t be dangerous anymore. It’s also important to pay attention to the points signed with ’E’, because these points mean possible defences for white as well. Thanks to the edge of the board or an earlier put white stone there are several ways to block your opponent’s opened three. Putting your white stone to the ’E’ points black is not able anymore to create opened four in those planned lines. In practice such blocking ways are seldom used, because they aren’t as safe as the blocks at points ’D’. By now the meaning of the basic structures, the notion of threes and fours are clear. A wise player blocks all of your threes and fours to prevent you from reaching victory. For the sake of beating a wise opponent – who is aware of the basic structures and knows what to block and at which moment – you need deeper-constructed structures. It means you must try to create a ’fork’- a move that creates two attacking lines at the same time. If you succeed in creating a fork you will have won the whole game, because your opponent won’t be able to block two opened lines with one stone. Points signed with ’H’ are winning forks, because the threes are opened ones, so the opponent should block both lines at the same times, but it’s impossible. Points signed with ’I’ are not winning forks, because the threes are not opened ones due to the closeness of the white stones or the edge of the board. In these situations only the four must be blocked to avoid losing the game. A fork consist of two threes can only be winning if both threes are opened. Points signed with ’J’ show winning forks because of opened threes. Points ’K’ don’t mean a winning fork because one of the threes is a closed one. By now you must be aware of the minimal basics of the game. You know the basic attacking structures and the theoretical part is clear. How does it pass off in practice? How do forks come into existence in real game? In the eleventh move black had created a 4x3 fork; therefore white could resign, because there’s no chance to defense. The mistake was the tenth move, because if white had blocked on the other side, black would not have been able to create a winning fork and the game would have gone on. The next step of game theory is also about the way that leads to victory so you need to be aware of two more basic notions. What does this notion mean in fact? VCT means a winning structure when somebody reaches victory by the continuous use of opened threats (that is, making a three which threatens to become a straight four, or making a four which threatens to become a five). This means if somebody has a VCT she/he has a win that results from making threats or series of consecutive threats. Black has a VCT because if he attacks continuously from the seventh move by way of using his threes he reaches victory. You can see below that black used his VCT correctly. Black used consecutive threats by the way of using his threes until white gave up. VCF is based on the same principle as VCT, the only difference is that continuous fours are used for the way of attacking instead of opened threes. Therefore VCF means a bit stricter structure than VCT. If you have a VCF you can continuously use your fours one after another to attack which means your opponent has no choice where to put, s/he has to block your pulled out fours. Although VCT is sure win because continuous opened threats are used for the way of attacking, the opponent has a possibility to use his/her own fours to hold back or postpone defeat. In the case of a VCF this option is out of question because fours must be blocked immediately. At the position below black has a VCF from the 14th move although it seems white has won the game with his double threes (stone 14). In fact the 14th move has been a mistake and it means white will have lost the game because black can reach victory by using his consecutive fours as you can see below. Black used his VCF wisely and without mistakes and therefore won the game. This notion means such a position where one of the colours has a sure win. When you have surewin it means a position where your opponent cannot have good answers to avoid losing if you play your position correctly. Here black has a surewin-position, which means that white doesn’t have a defence against black’s upcoming attack. This sw-position is a VCT at the same time. Black used correctly his sw-position and VCT from the 11th move and won the game. It follows from the explanations that every VCT and every VCF is a surewin as well. If somebody has a VCT or a VCF it means that s/he has a surewin-position at the same time. In contrary with this not every sw-positions mean VCT or VCF at the same time. These situations are very hard to recognize. Most players immediately start to use their threes or fours when they meet a situation that is presumably a surewin, so they let the opportunity to win slip away and destroy their own surewin. Beginners don't have to recognize these situations temporarily because finding the appropriate move needs deep analyzing. It is noticeable that if black starts to attack directly he will be in trouble at the 13th move because white can block black's attack with an open three. If white can stop black's attack and take over control from black, black must waive surewin and the game will go on. That's why black must figure out that it's a surewin position and must find the perfect move so as not to let white take control of the game. If black succeeds in finding the right move white cannot avoid losing the game.